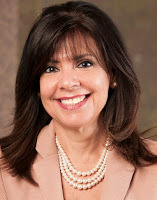 Maricopa Community Colleges Chancellor Maria Harper-Marinick has joined Arizona Board of Regents President Eileen Klein and College Success Arizona President and CEO Rich Nickel in leading Achieve60AZ-- a new, statewide effort to help more adults earn education credentials. 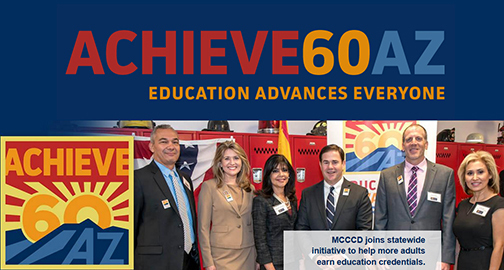 Check out this Achieve60AZ video with Gov. Doug Ducey and Arizona leaders who joined together to announce this initiative to equip 60 percent of Arizonans with a certificate or college degree by 2030. Here is a special message from the Chancellor about this initiative. Last week (Sept. 15, 2016), a community-based alliance of business, philanthropic, and education organizations came together with AZ Governor, Doug Ducey, to announce a statewide goal to increase the educational attainment of all Arizonans. Today, only 42% of residents (ages 25-64) in the state currently hold a post-secondary certificate, associate’s degree, bachelor’s degree, or higher – that is fewer than four out of every 10 working adults. Post-secondary completion must be top priority in Arizona in order to boost economic prosperity and national and global workforce competitiveness. The goal - to ensure that 60% of Arizonans 25 and older have a certificate or college degree by 2030 - is the charge of the alliance. The partners that have joined Achieve60 believe in the value and power of education to change lives and positively influence society. Arizona community colleges are proud partners of Achieve60 and are perfectly positioned to address the achievement gap. Statewide, community colleges serve more than 300,000 students each year, confer more than 43,000 certificates and degrees, and transfer nearly 11,000 students to in-state universities. The Maricopa Community Colleges alone, offer programs in 95% of the highest demand occupations in the Greater Phoenix area. Each year, nearly half of our 27,000 graduates leave a Maricopa college with an Associate’s degree or a Certificate of Completion in an occupational area of study. Relevant workforce training is imperative, but student success goes far beyond the classroom. The K-12 bridge programs, university transfer pathways, developmental education courses, tutoring, advising, mentoring, and career guidance that community colleges offer are crucial to the success of our students. The collective effort of the community colleges and the entire Achieve60 alliance will result in greater awareness of the importance of post-secondary education, a knowledgeable and innovative workforce, a higher standard of living, and a thriving business community. I encourage you to go to ACHIEVE60AZ.com to learn more.